Chamber Chorus of The University of California, Berkeley, Marika Kuzma, director. This rarely heard and even more rarely recorded mass by Dufay (ca. 1400-1474) uses a transcription by the late Prof. Thomas Binkley. Marika Kuzma came across this transcription when she was Prof. Binkley’s assistant during her last year of graduate school at Indiana University. Recorded during the 1996 Berkeley Early Music Festival, it is dedicated to Prof. Binkley’s memory. 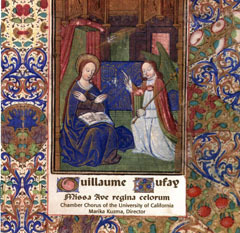 Missa ave regina celorum is a vivid example of what French poet Martin le Franc (ca. 1450) called “le contenance Angloise,” (“The English Countenance”). Certainly this mass adopts many of the English practices of the time, notably the polyphonic setting of all 5 mass movements (Kyrie, Gloria, Credo, Sanctus, and Agnus Dei) based on a single melody or plainchant. This CD is specially priced at $11.98. Note: The “Sanglier” label is Wildboar’s new special-projects label which was established to release recordings that are a little outside Wildboar’s usual repertoire.